III. The so-called "gender pay gap." 1. The media continually touts the "gender pay gap" which is the claim that women allegedly earn 23% less than men for equal work. 3. That figure is calculated by comparing the salary of the average man and woman working full time. 4. It does not account for hours worked, occupations, college majors, length of time in the workplace, and other factors. A. Men generally work in more lucrative occupations while women generally work in lower paying occupations which offer more schedule flexibility. i. Men choose professions such as engineering, programming, and manufacturing which are higher paying. ii. Women choose professions that focus on social interaction such as psychology, sociology, and early child development which are lower paying. B. Men generally work more hours and don't take time off for extended periods. C.	Women work fewer hours and take long sabbaticals from work to raise children. 5. When all of these considerations (and others) are factored in, the gender pay gap narrows to about 5-7% at most. 6. If employers could really pay women 23% less for equal work, they would fire all of their male employees and hire all female employees and enjoy a much higher profit margin than their competitors. A. The same people that say that employers discriminate against women and pay them less than men also say that corporations are greedy and pay workers the absolute minimum that they can. B. They can't have it both ways. IV. The government cannot create economic equality. 1. To use the government to create economic equality is immoral. A. The government doesn't produce anything, so whatever they give to one person must have been stolen from another. B.	Thou shalt not steal (Exo 20:15). C.	Rich men, not governments, are to be "ready to distribute, willing to communicate" a portion of their wealth to others who are in need (1Ti 6:18). 2. To use the government to create economic equality is inefficient. A. To take resources away from producers and give them to consumers will create a society of less producers and more consumers. B. This means a society with less material wealth. C.	Both the rich and the poor only get poorer under this foolish system. 3. To use the government to create economic equality is impossible. A. Even it were possible to achieve economic equality, it would not last. B. The first transaction after equality was achieved would create inequality. C.	Thus the government would never reach its goal. D.	That's the way they want it. E.	Contrary to their stated aims, the government loves inequality because it gives them an excuse to grab for ever more power and control of the population. 4. The following passage is from Vladimir Bukovsky's To Build a Castle. "This dream of absolute, universal equality is amazing, terrifying, and inhuman. And the moment it captures people's minds, the result is mountains of corpses and rivers of blood, accompanied by attempts to straighten the stooped and shorten the tall. "I remember that one part of the psychiatric examination was a test for idiocy. The patient was given the following problem to solve: 'Imagine a train crash. It is well known that the part of the train that suffers the most damage in such crashes is the carriage at the rear. How can you prevent that damage from taking place?' The idiot's usual reply is expected to be: Uncouple the last carriage. That strikes us as amusing, but just think, are the theory and practice of socialism much better? "Society, say the socialists, contains both the rich and the poor. The rich are getting richer and the poor poorer. What is to be done? Uncouple the last carriage, liquidate the rich, take away their wealth and distribute it among the poor. And they start to uncouple the carriages. "But there is always one carriage at the back, there are always richer and poorer, for society is like a magnet: there are always two poles. But does this discourage a true socialist? The main thing is to realize his dream; so the richest section of society is liquidated first, and everyone rejoices because everyone gains from the share-out. "But the spoils are soon spent, and people start to notice inequality again -- again there are rich and poor. So they uncouple the next carriage, and then the next, without end, because absolute equality has still not been achieved. Before you know it, the peasant who has two cows and a horse turns out to be in the last carriage and is pronounced a kulak and deported. Is it really surprising that whenever you get striving for equality and fraternity, the guillotine appears on the scene? "...It is difficult for man to resist this dream and this noble impulse, particularly for men who are impetuous and sincere. They are the first to start chopping heads off and, eventually, to have their own chopped off." V.	Why stop at economic equality only inside of the US? 1. If all people should be economically equal, then the wealth of wealthy Americans should be distributed to the poorest of the earth. 2. This means that the minuscule wealth of the poor in America would have to confiscated and given to those who are far poorer in Africa or Asia. 3. This would require a world government to carry out this atrocious scheme. VI. Increasing education budgets will not create economic equality. 1. The average cost of educating a child in the US is $11,392 per year. 4. If spending $11,392 or more per student per year hasn't fixed the problem of inequality, then throwing more money at it obviously won't help. 5. Wisdom cannot be imparted to fools simply by spending money (Pro 17:16). VII. The desire for equality is simply greed fueled by envy. 1. Greed n. - Inordinate or insatiate longing, esp. for wealth; avaricious or covetous desire. A.	Greedy people trouble their own house (Pro 15:27). B.	Lazy people are often greedy, wanting what others have that they are too lazy to work for (Pro 21:25-26). 2. Envy - 1. Malignant or hostile feeling; ill-will, malice, enmity. Obs. 3. The feeling of mortification and ill-will occasioned by the contemplation of superior advantages possessed by another. Const. at, of, to, upon (persons), at, of (things). Phrases, to feel (have) envy. A. Envy is one of the most vicious sins (Pro 27:4). B. Envy causes hatred and ill will toward others (Mar 15:10; Act 7:9). C.	Envy will ruin a person (Pro 14:30). D.	Envy causes strife, including social strife (Jam 3:16). E.	Greed breeds envy (Jam 4:5). F.	Christians should not be envious of anyone (Rom 13:13; Gal 5:26). 3. Those that clamor for equality are not content. B. We must be content with such things as we have (Heb 13:5). C.	Inequality is a fact of life which we must learn to live with. D.	What someone else has should have no bearing on our contentment. i. What does it matter if there are billionaires out there that have multimillion dollar homes, yachts, and cars? ii. Does someone else's excessive riches affect your quality of life? iii. It only does so if you let it through envy. VIII. Economic inequality is actually a good thing. 1. 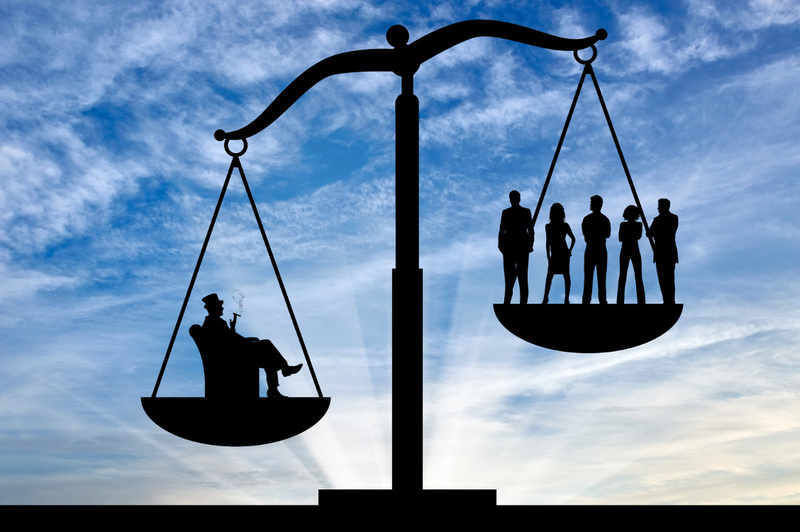 Inequality is good as long as it is caused by the free market and not by fraud, theft, or cronyism (corporations getting contracts from government through bribes or lobbying). 2. A free market economy will facilitate some people becoming wealthy because of their entrepreneurship, diligence, and foresight. 3. That is a good thing because wealthy people invest their money in businesses and capital equipment which end up employing non-entrepreneurs and making their labor exponentially more productive. 4. This increases everyone's productivity, and consequently their wages, making everyone more wealthy than they would have been otherwise. IX. Inequality is not the issue. 1. The disparity of the wealth between the rich and poor is not nearly as important as whether or not the standard of living of the poor is increasing. 2. The standard of living of the poor has increased dramatically over the last 200 years. 4. The gap between the standard of living of the rich and the poor has narrowed greatly over the last few centuries. A. A few hundred years ago, the rich road in a four-horse carriage, while the poor walked. B. Now the rich drive a fancy car while the poor drive a clunker. C.	That is a huge improvement in the standard of living of the poor in comparison to the rich. D.	Even if the rich are getting richer at a faster rate, the poor are still getting richer, so why are people complaining? 1. One of the reasons that we should work is to have money to give to those in need (Eph 4:28). 2. Helping people financially should be limited to supplying their needs, not lusts (Rom 12:13; Jam 2:15-16). 3. The love of God is not in us if we will not give to someone in genuine need (1Jo 3:17). 4. When brethren in the church are in need due to no fault of their own, those that have been blessed with abundance should supply for their need (2Co 8:13-15). 5. Rich men should be ready and willing to give to people who are in need (1Ti 6:17-18). 6. This should be done voluntarily, not through compulsion by government. A. When the government gives to the poor, they do so by forcing one person to hand over their wealth to another person. B. When the government provides help to those in need, it does so very inefficiently. C.	Government aid also reduces the incentive for individuals to help the poor because they assume that they are already doing so through their taxes. D.	The best thing the government can do to help the poor is to not help them and instead let society help them. i. The government can do so by ceasing to tax and regulate businesses which will enable them to hire more people and increase wages which will do much to help the poor. ii. The government can also help the poor by not running up deficits and printing money which devalues the money and increases the costs of everything. 7. Charity should begin close to home (Deu 15:7-11). A. When it is, the money will more likely be given only to those who can't work, not to those who won't work (2Th 3:10). B. When charity is kept close to home, a wise man can give with discretion because he has personal knowledge of the need (Psa 112:5). C.	This will help to greatly reduce fraud. D.	This will also help to ensure that charitable giving is a means to an end for the poor, not the end itself. 8. We will never be able to end poverty entirely, but we can help to alleviate it in the lives of those with whom we are in contact within our families and communities.